As always, there are new things to try preserving, encasing in batter, or drying. Right now I'm mainly working on the first and third of those techniques. 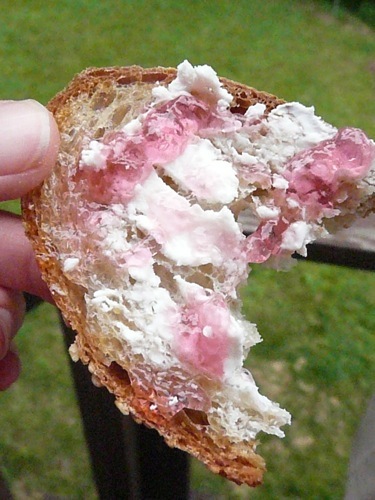 The left photo is my first attempt at rose petal jam (here on bread and goat cheese, and yes, that's my man thumb holding it). I was at a friend's house for dinner and we were sitting outside, just about next to this beautiful shrub rose with bright fuchsia blooms. Of course, I didn't hesitate to ask if I could literally deflower it for my selfish needs. I had a recipe from these crazy guys, who put everything that grows in northern MD, central DE, and southeastern PA in jars and serve it as cheese plate accompaniments. I had a vague idea of how it would turn out, definitely floral, maybe sickeningly sweet, and colored a barely-there hue of pink. I was drastically wrong about the flavor and color; it is floral, but in a delicate way, showing more nuance than I expected. And the color is unbelievable! I wish I could have caught glistening in the sun, but sadly, there was none by this afternoon. Take my word that it is a glorious bright shade of deep pink, lovely to look at and quite delicious. Oh, and the other photo is something I took from those same friends (bet they're real glad they asked me over! now their yard is bare). 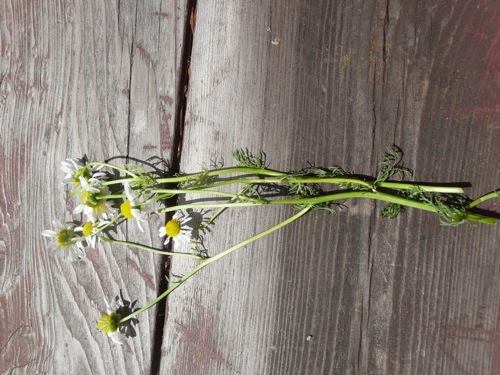 I planted chamomile from seed this year, but apparently those tiny seeds drowned or blew away or just never germinated. They had lots of it, so I am drying some to use in future pastries, along with lavender, which actually is from my garden. I've found that chamomile is good in shortbread, infused in the butter, and ground and blended with turbinado sugar to be sprinkled on top. It's funny–as much as I love tea, I've never been fond of drinking a tisane of chamomile (it's not a tea since it's not made from the actual tea plant)...but I do like its flavor in a flaky, buttery cookie!